Predictive policing is working in Atlantic City, according to statistics for the first three months of the program. Shootings and homicides were down 7 percent and robberies 27 percent from February through April, said Rutgers Professor Joel Caplan who developed the system. Risk Terrain Modeling is a new way of looking at crime that focuses on what attracts crime to a certain area rather than the people who live in or frequent there. The model was featured on National Geographic’s “Breakthrough” series last week. “It focuses on places and not necessarily people,” Capt. James Sarkos said on the show. And that varies depending on the town. In Newark and Chicago, for instance, bars are a significant risk factor for robberies. In Kansas City, that’s not the case. Atlantic City’s big issues were vacant lots near Laundromats. The view fits well with residents of the city’s more crime-ridden areas, who have long said the problems come to them. “Not only is it not the people located there that are necessarily committing the crimes, also people there are being disproportionately affected by it,” Caplan said. 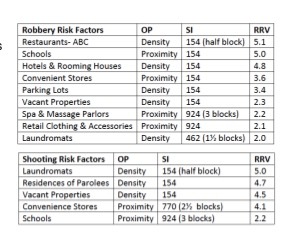 One finding that proved surprising was that housing complexes were not at higher risk. Meaning Stanley Holmes Village or a Back Maryland development is not at higher risk. “This is not just an analytical strategy, it’s a mindset,” he said. And, it seems to be working. “Is it possible to know when crimes will happen and who will commit them?” narrator Aaron Eckhart asks in the “Breakthrough” episode. They seem to at least have the where down. In 2015, 5 percent of the high-risk places identified through RTM accounted for 45 percent of the shooting incidents. Last year, Rutgers and Atlantic City police worked together running various models to see how successful the intervention could be. After seeing virtual success, the program officially began in February. In monthly meetings, Rutgers and the police meet. There are also ACTION meetings, which involve stakeholders, so that the community is a part of the solution. Assessment, Connections, Tasks, Interventions, Outcomes and Notifications acts as an agenda for the meetings, Caplan explained: assess risks, make connections between risk factors and behavior that tends to be occurring, assign tasks to task managers, come up with an intervention plan, assess the outcome of the previous plans and make improvements, and notify the community to keep everything transparent. The numbers for May aren’t in yet, so Caplan couldn’t comment on the three homicides in the Back Maryland section of town. That comes with getting the community involved. In the first three months, there have been nearly 900 business checks at more than 79 different locations.